Are you looking for a different kind of adventure and are not afraid of heights? Are you ready for a new vacation experience? With the three activities suggested here, you can admire the spectacular landscape of Eastern Québec from high up. 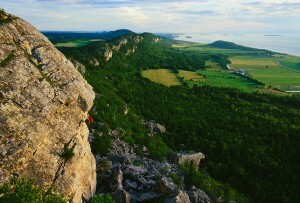 Located in Saint-André-de-Kamouraska in the Bas-Saint-Laurent region, the Société d’écologie de la batture du Kamouraska (SEBKA) offers access to some of the most famous cliffs in Quebec. These orthoquartzite marvels are ideal for climbing. With over 115 trails, there is something for everyone. Once you reach the top, take a moment to admire the breathtaking view of the St. Lawrence and the mountains of the Charlevoix and Côte-Nord regions. Keep in mind that some of the equipment you will need for this activity is not provided and that you must purchase your ticket at the welcome centre. Lessons with a qualified instructor are available for beginners, and equipment is included. Why not give it a try? You can extend your visit with an overnight stay at the SEBKA campground and try out some of the other activities offered, including sea kayaking. In Saint-Gabriel-de-Rimouski, also located in the Bas-Saint-Laurent region, Domaine Valga offers an activity for young and old alike. No fewer than 94 challenges over six trails (including a trail for children) are waiting for you to give them a try! 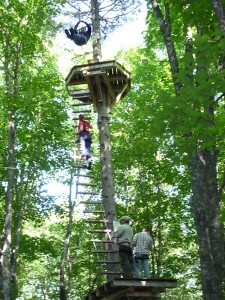 In the Forêt de Maître Corbeau, vacationers of all ages can enjoy treetop challenges in the enchanting setting of an old-growth forest. Under the supervision of experienced guides, you will cross suspension bridges, fly along giant zip lines, hurl into open space on a Tarzan rope, land in a vertical net, and climb up to reach another exciting challenge. Unleash your inner adventurer on the longest zipline in Québec, with 365 metres (1200 feet) of pure thrills! This activity is extremely safe. You will be accompanied by guides the entire time, and your safety harness will be securely attached to safety lines. Be sure to wear good walking shoes because you will be walking on logs, metal wires, stirrups and over tree roots in the forest. If you have already visited the Forêt de Maître Corbeau in the summer, why not see what it has to offer in the winter too? In need of a little adrenaline? The Îles de la Madeleine offer ideal wind conditions for kitesurfing, a sport that, as its name suggests, combines kites and surfing. In this activity, the kitesurfer stands on a surfboard and is pulled along the water’s surface by a traction kite. 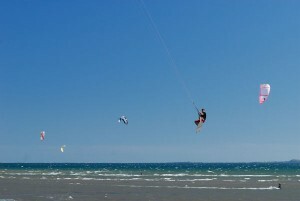 Aérosport, the first kitesurfing school in Canada, offers a variety of lessons, from beginner to experienced. You will learn to control your kite in a safe environment, under the guidance of dedicated and professional instructors. Lessons are private or semi-private (maximum of two students per instructor) to ensure you progress quickly. And, since Aérosport owns the property where the lessons are given, you will not be disturbed. From a safety standpoint, the location is ideal because you can learn to kitesurf in shallow water (waist level) with a sandy bottom. Also, Aérosport uses personal watercrafts to take you out to the windy areas, which saves you a lot of time and energy. We will lend you all the equipment you need for your lessons: wetsuit (men’s, women’s and children’s sizes), boots, harness, kite, surfboard, etc. If you have kitesurfed before, you can rent or purchase equipment on site. Aérosport also offers other sporting activities, such as sea kayaking and kite buggying. So, do you want to see what the maritime regions of Québec have to offer from up high? If you are a little concerned about trying out these activities, there is nothing to worry about. Anyone can enjoy them because you go at your own pace, according to your level of experience.